Hayley’s boss has volunteered her to be a judge for the Key West Topped Chef contest hoping to score some extra publicity for his magazine. Hayley is both nervous and excited until she realizes one of the other judges is Sam Rizzoli. She just slammed his restaurant in her very first negative review. When Rizzoli ends up dead speculation is one of his business rivals is responsible but Hayley has a feeling maybe someone is taking the chef contest a little too seriously. Hayley sees the police are not following the right leads so she decides it is up to her to serve up the actual killer. Lucy Burdette has me in love with Key West. Life on a boat in nice sunny Florida eating her way through all the delightful cuisine the area has to offer. Hayley better watch out I want to steal her job! Burdette is such a strong writer and creates really lively characters and puts them in spectacular situations. The plots are tight and the twists are plenty. The murder takes us from the docks to the inner workings of a reality tv show and even into the world of drag queens. I absolutely loved it. The new characters turned the story on its ear while they recurring characters continue to steal out hearts. Hayley’s mom even appears in Key West via Skype and Gloria becomes Hayley’s sidekick in the investigation..
A new character to this story is someone returning to Key West. She has disrupted Hayley’s life with her return and I am very interested to see how she effects it in future installments. Maybe a new direction is just what Hayley needs. Add this one to your Summer Reading Lists! An impressive read that will tickle all of your senses. There are recipes included too!! so you can actually tickle your taste buds!! New Jersey born clinical psychologist Roberta Isleib took up writing mysteries to justify time spent on the links. Her first series, featuring a neurotic professional golfer and a sports psychologist, was nominated for both Agatha and Anthony awards. 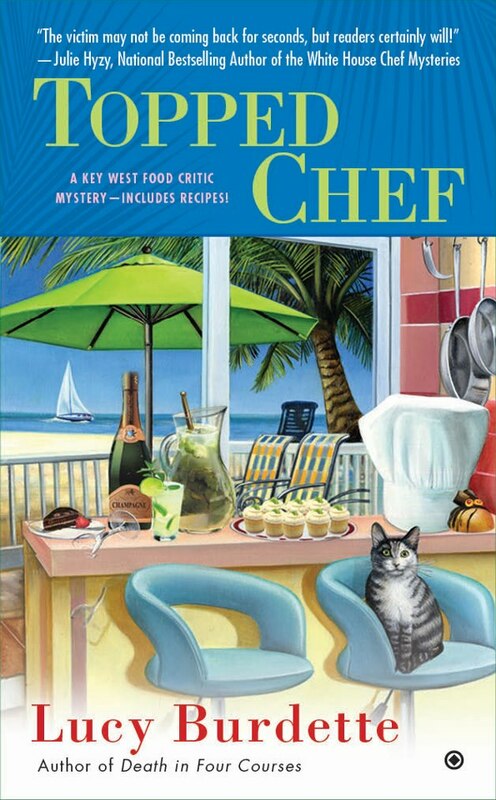 Roberta is now writing the Key West food critic mystery series as Lucy Burdette. Check out Lucy’s blog here. Her alter ego’s website here. She is one of the Jungle Red Writers.